It is June of 1895, and Detective Frank Geyer, one of Philadelphia’s most notable detectives, contemplates his current assignment, a man named Mudgett who goes by the alias H.H. Holmes. Holmes has been put in custody, arrested seven months ago for insurance fraud. The final part of The Devil in the White City picks up two years after the end of Part 3. Larson may have chosen to do this because there just isn’t that much information about what Holmes did in the intervening two years. At the same time, telling this part of the story from Geyer’s point of view makes it clear that it’s a detective story, and exciting enough to be its own book. Holmes, who used to live in Chicago, had traveled to Forth Worth, St. Louis, and Philadelphia, cheating insurance companies. In Philadelphia, Holmes gained 10,000 dollars, seemingly by faking the death of Benjamin Pitezal. The insurance company, Fidelity, had hired the Pinkerton National Detective Agency to track down Holmes; Pinkerton found him in Vermont. Once arrested, Holmes confessed to fraud. Later, it became clear that he had murdered Pitezal, not faked his death. Detectives also learned that three of Pitezal’s children were missing, and last seen with Holmes. This expository information maps out the course Part 4 will take: Geyer will investigate Holmes’s crimes, and attempt to locate Pitezal’s children. Though Geyer isn’t aware of it, Pitezal once counted himself a close ally, and even a friend of Holmes’s. While this underscores how treacherous Holmes can be, it also suggests that Holmes is getting desperate — he’s had to leave Chicago and sacrifice the people he depended upon to get away with his crimes. Geyer interviews Holmes in his jail cell. Holmes insists that he last saw Pitezal’s three children with Minnie Williams, who was taking them to see Pitezal himself, now in hiding. Geyer doesn’t trust Holmes, and finds him to be suspiciously smooth. Though Geyer doesn’t yet know this, the reader understands the absurdity of Holmes’s blaming Minnie Williams, a woman who’s dead by now, for the disappearance of Pitezal’s children. Another sign that the noose is tightening for Holmes is Geyer’s suspicion with his character — unlike the women and men Holmes seduced, Geyer isn’t the least bit sympathetic or attracted to the man. Holmes claims that he found a cadaver that looked like Pitezal, set it on fire, and then pretended that the body was Pitezal’s. To verify, the coroner asked that a member of Pitezal’s family confirm the body’s identity. Pitezal’s wife, who was ill, sent her second-eldest daughter Alice, who was fifteen years old. She confirmed that the body was Pitezal’s. Holmes convinced Pitezal’s wife to take Alice and two of her other children, including a boy, Howard, to see Pitezal. The pace of Part 4 is much quicker than that of the previous sections of the book. Larson doesn’t reconstruct these scenes from the perspective of the characters immediately involved in them (Holmes, Alice, Mrs. Pitezal); instead, he uses a “frame narrative” from Geyer’s perspective to get the information across. Alice wrote letters to her mother, saying that she disliked Holmes and didn’t find his manner charming. Geyer knows that this letter never reached Alice’s mother. Holmes collected the children’s letters in a box. Mrs. Carrie Pitezal is worried because she hasn’t heard from her children, though Holmes assures her that they’re in London with Minnie Williams. Geyer isn’t sure if he’ll be able to find the children, but the District Attorney encourages him to look further. The fact that Holmes collects the letters instead of burning them will quickly result in useful evidence for Geyer, but it also suggests how sadistic Holmes can be — he seems to take great pleasure in owning and controlling the children’s correspondence and being reminded that it will never reach Mrs. Pitezal. Geyer travels to Cincinnati, where he tries to reconstruct the children’s journey. He goes to the Atlantic House hotel and finds records of an “Alex E. Cook,” one of Holmes’s aliases, written in Holmes’s handwriting. This leads Geyer to the realty office of J.C. Thomas, who remembers a man of Holmes’s appearance staying there. Thomas refers Geyer to a woman named Henrietta Hill, who lives near the house where Holmes seems to have stayed. Hill tells Geyer that she saw a large iron stove being delivered to Holmes’s residence. Geyer guesses that Holmes had planned to use the stove, but then left when he noticed that he was drawing attention from his neighbors. Holmes’s travels across the country seem like a good strategy for avoiding detection, but they also put him at a disadvantage. In Chicago, he could commit his crimes from behind the walls of his hotel; in smaller, more open cities, he doesn’t enjoy the same anonymity he found in Chicago, and thus has to keep moving whenever neighbors become too suspicious. Still, even when Henrietta Hill witnesses Holmes carrying an iron stove, she’s no more disturbed by it then the people who saw Holmes with unusual equipment in Chicago — people are alike all over, it would seem. Geyer, now assisted by Detective David Richards, traces Holmes to a hotel called Circle Park, where he finds records of a Mrs. Georgia Howard, a name he believes refers to Holmes’s fiancée, Georgiana Yoke. Geyer begins to see that Holmes led Yoke and three children into different hotels in the same night. He goes to a saloon in West Indianapolis, where a man named Herman Ackelow tells him that he remembers seeing Holmes with three children. Holmes excels at using aliases to conceal his crimes and inspire a feeling of security in other people. Later, when he’s with Minnie and then Georgiana, his deceptions become less smooth, and he’s forced to think of more elaborate lies for why some people call him by one name and other people call him by another. Here, he’s forced to go one step further and make other people adopt aliases. Reading through the Pitezal children’s letters, Geyer sees that they were kept in cold, lonely rooms and isolated from their family, but also fed well and taken to the zoo. Geyer can’t understand why Holmes would kill three children for no rational reason, especially since he fed them well and traveled with them all over the country. Geyer remains unclear about Holmes’s motives for murder, but this is only because Geyer doesn’t understand that it’s possible for Holmes to be so evil and sadistic. This lack of understanding has kept Holmes safe from detection throughout the book. Geyer begins to understand that Holmes is not a rational human being. Geyer travels to different hotels, always asking for information about Holmes. He is persistent and tireless — but his weakness, Larson notes, is that he thinks that evil has limits. Geyer learns that Mrs. Pitezal traveled with her two other children, meaning that Holmes was now manipulating three different groups — his fiancée, Mrs. Pitezal and her two children, and her three other children. Geyer realizes, amazed, that the latter two parties were only a few blocks away from each other, though they were cold and desperate to see each other. As Geyer becomes more and more involved in Holmes’s crimes, he begins to get a feeling for Holmes’s psychology. Holmes has no practical purpose for moving the children around; rather, he delights in torturing them. The process by which Geyer comes to realize this mirrors the research that Erik Larson himself conducted — Geyer may be the closest thing to a stand-in for the author of The Devil in the White City. Geyer hasn’t quite put together what Holmes has done, but he does realize that Holmes is motivated by cruelty, not material gain. Readers, more familiar with Holmes and his actions, can guess that Holmes has killed Howard. Arn, Jackson. "The Devil in the White City Part 4, Chapter 1: Property of H.H. Holmes." LitCharts. LitCharts LLC, 1 Jul 2015. Web. 24 Apr 2019. Arn, Jackson. 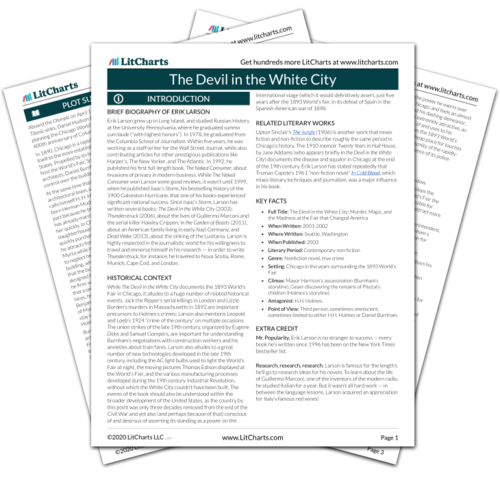 "The Devil in the White City Part 4, Chapter 1: Property of H.H. Holmes." LitCharts LLC, July 1, 2015. Retrieved April 24, 2019. https://www.litcharts.com/lit/the-devil-in-the-white-city/part-4-chapter-1-property-of-h-h-holmes.